Lately as I’ve been reading God’s Word, I’ve found myself simplifying Scripture by breaking it down into instructions or commands. Today as I was reading Psalm 139, God stopped me at David’s “instructions” to Him in verses 23-24. 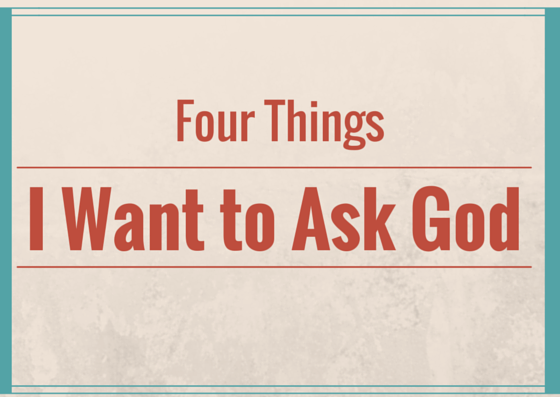 Since I’ve never been super comfortable telling God what I want Him to do, (I’m not saying David was wrong there, I’m just sayin’ it’s not some place I’m goin’ at this stage in my life), I figured I would turn them into questions. 1) Lord, will you search me and show me my heart? I need to know what it’s really like. Don’t let me fool myself or let pride overtake me. 2) Lord, will you test me and show me my anxious thoughts? I need to know where I’m not trusting so my faith can grow. 3) Lord, will you see if there is any offensive way in me? I’m often blind to my own faults, and I need you to open my eyes. 4) Lord, will you lead me in the way that leads to life forever with You? I never want to be without you again. I love these. Because I know without a doubt that as I stop and ask these questions that He will always answer, “Yes.” Even if the truth may hurt a little. Because He loves me like that–and as I sit here on my couch writing, that thought gets me smiling. Here’s another thought that gets me smiling. He loves you like that, too. Just ask Him! 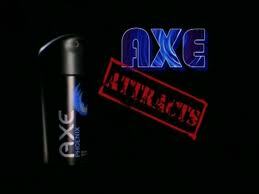 Axe Body Spray. ‘Nuff said. It’s the stuff allergy attacks were made of. I think we would all agree the stuff smells better after a shower than as a shower, and we can only hope that the knowledge of the truth of the saying, “a little bit goes a long way,” will come someday to the boys with the over active spray bottle trigger fingers. At that time they will see that smelling sweet, and smelling sweat are not the same thing. And Cornelius answered, “What is it, Lord?” Dontcha just love that? I sure do. I don’t know if he was answering as a centurion, almost a, “Yes, sir?” or if he was just so used to talking to God that it was simply a natural response. I like it either way. And at the bottom of my journal page today, I wrote, “It’s really this simple.” Commitment. Respect. Generosity. Relationship. With God. For God. Simple truths. Pleasing aromas. And although a little Axe can make a guy smell sweet, the Acts of God’s people, coming from the heart as they live for Him are truly sweet smelling, indeed. Teaching this truth to your kids? Get together several items, or body sprays, with different smells–some good, some not so good. Don’t forget the Axe. With older kids you can even talk about how they sometimes do a smell check!! Let the kids talk about which smell good and which don’t. Then share the story of Cornelius helping kids to see that everything we do is an offering before God challenging them to do a quick check to see how they are smelling spiritually. The St. Louis City Museum is simply a rare treasure of a place, and I think it becomes even more so when you are blessed enough to spend the day there with some of your favorite 6th graders in the world. Just last week, my husband and I took some of our Cross Country students (cross country as in Jesus and the cross, not as in running long distances, something I am not prone to do) on a trip from our home church in Iowa to St Louis. It was a toss up between the zoo and the museum to be determined by the Lord’s determination of the day’s weather. We didn’t know until that day exactly what the weather would be, and so we waited with anticipation for what was to come. And when the Lord determined to bring rain, we determined to hit the museum. It turned out to be a great choice since none of our kids had been there before, but even more so because at the heart of the St. Louis City Museum is the fact that everything in it once resided somewhere else. Most of it in St. Louis (hence the name). Everything had been recycled, reworked, retooled, repainted, etc. and the old became new again. It really is a work to see how they’ve intertwined all this stuff into something incredible, and somehow fitting it together in a glorious harmony–the slides, the caves, the crawling places, the sculpture, the bank vault, the . . .well you get the picture. And I couldn’t help but smile. Because He was right. (Well, of course He was, He’s the Holy Spirit.) But He made it so simple to see. Each piece of the museum if left in its rusted, broken down original condition would have been worth little, but at the touch of the master’s hand, value was restored and something amazing created. And we are just like that, and for that I am thankful.Then I thought about “my” 6th graders. As He takes their lives into His hands, I can’t wait to see what He will do with them–how He will rework them, retool them, and carefully place them within His grand scheme for His glory to do the good works He has planned for them. I can only imagine. . . and wait with anticipation for the things that are to come. And so it was a spiritual trip after all. Thank you, Jesus! 2 Corinthians 5:17 therefore if anyone is in Christ. He is a new creation. The old has gone. The new has come. I Can’t Get No Satisfaction. . . Or Can I????? Almost two years ago I began reading through the Old Testament–in reverse. Somehow or other I meant to start rereading the New Testament, but found myself caught up in Malachi. From there, I moved on to Zechariah and then just got it in my head to start at the end and work my way to the Genesis!! My method, desribed in a previous post, 20 minutes with Jesus, explains my slow trek. Every day I read a passage from Old Testament, one from the New and a Psalm. However, when I read, I read just until I sense God stopping me for something I need to see, see again, think over, etc. At that point, I write down what it is I believe God wants me to see and work to apply these things to my life, teaching and leadership. It’s a slow ride for sure, but well worth the time. This May, I’ve found myself in Ecclesiastes. A book I know I have skimmed through before, but have never really settled down and spent any quality time in. So the things that I’m seeing this time are pretty eye opening to me. Hats off to any of you who are Ecclesiastical scholars, because I have to say, this book has some real treasures in it. Which of course, you who are scholars already know! Pretty much the author, some say it’s Solomon, some say it’s not. . . .can’t get no satisfaction. Everything is a “meaningless” or a “chasing after the wind.” And he’s tried, and he’s tried, and he’s tried. . . .but he can’t get no . . .satisfaction. Seriously, it’s so fitting for today. How many people do you know who are just never satisfied? We evaluate and evaluate and evaluate. We measure our successes by the guy next store’s successes, by the size of our bank accounts, our jobs, styles of our vehicles, and BMI. But Solomon (or not) brings us back to the truth that we can indeed get satisfaction when God is the center of our lives. Can’t get no satisfaction? Yes, you can. Look to Jesus. It’s a simple as that. Whatever He does will last. Finding satisfaction is a gift from Him. Whether it’s work, or laundry, or traffic, or finances, or health, or whatever, you can find satisfaction when you begin to acknowledge and understand that we live and move and breathe and have our being because of Christ’s rule and reign, power and control, salvation and deliverance in our lives. To know that we have been given each day as a gift of life, when if fact, we deserve death and that we can live each one for Him so that men will revere Him is satisfaction guaranteed. Anything else is like, well, like a rolling stone. The text began with the words, “Hey Mom, no cause for alarm, but I’m in the hospital.” Ohhhh Kayyyyyy. Followed by something like, “I won’t be able to put money on my phone from here, but someone will message you.” Two hours later a following text asks, “Am I immunized for diptheria?” Ohhhh Kayyyyyy. No cause for alarm though, Mom, even though I’m across the world in another country where, by the way, I moved without ever giving you my complete phone number! “No cause for alarm” because Jesus’ arrest was part of the plan. “No cause for alarm” because His death was part of the plan, too. “No cause for alarm” because with His plan His body wouldn’t stay in the tomb. “No cause for alarm” because His plan included leaving them the Holy Spirit. “No cause for alarm,” because His plan promises that He’s coming back again. 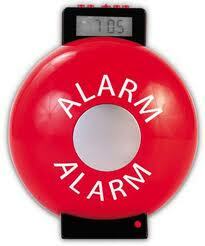 “No cause for alarm” because He’s God and we can trust Him and His ultimate plan–whatever happens.